Make money with your gay traffic! We provide you with fresh new content every week for your adult surfers! We provide you with new content, updated every week! Download previous archived content quickly & easily in downloadable ZIP files! 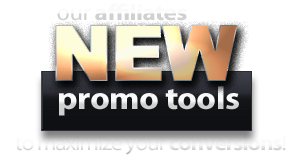 Affiliate promotional tools to help you maximize your referrals! Get up-to-the-minute content updates & information, sent to you with our RSS feed! Make 50% per signup Revenue Share! Make 10% per webmaster referral for the lifetime of all their sales! Get great fast & friendly customer support! Take advantage of this unique opportunity to promote high quality, exclusive content from one of the most well-known names in the gay community. In marketing, interaction is probably one of the main keys to success along with the quality and exclusivity of the product being offered. Our weekly new videos and live chat sessions will have surfers constantly keeping an eye out for fresh hot new exclusive content! Sign up today and start feeding your gay hungry surfers & filling your wallet! content out there before anyone else! Our affiliate program is run through our processing company, Zombaio. Unlike the other payment processing companies that charge 14.5% - 16% in processing fees, Zombaio's low 5.9% processing fee takes a smaller amount off the net sales, which in turn makes you a higher profit than other websites' programs where you lose 8.5% or more due to those higher processing fees. We would appreciate the referral as well! For anything do to with your account stats, payments, sales & traffc information, you have to login to Zombiao to access or modify any of the previously stated information dealing with your account. If you have a problem pertaining to any of those itemns and need assistance, please contact Zombaio Support. and to manage your Zombiao Affiliate Account. Choose some advertising banners to place on your site in our banner farm! Download some free Brent Everett content for your site! choose the images to place on your website. Then choose your tracker codes from the Tools/Linking URLs page to link the images to. Other questions? Need more help? Look at our FAQs page or contact BrentEverett.com Support.